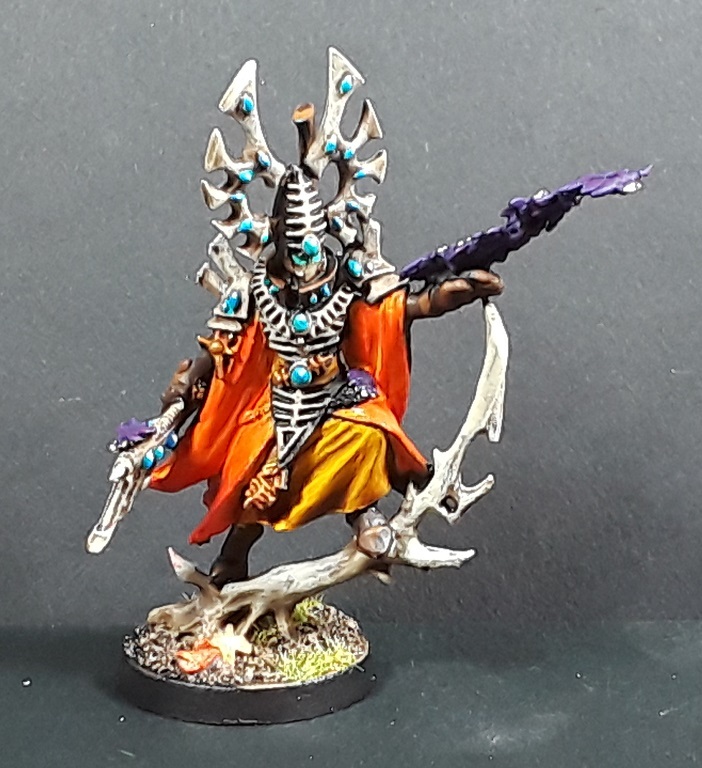 Mordian 7th Regiment: 40k Exodite Eldar - Glade Guardians and Bonesinger painted! 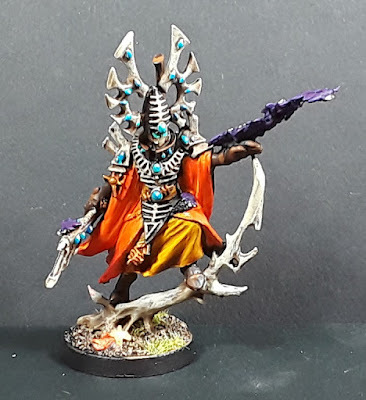 40k Exodite Eldar - Glade Guardians and Bonesinger painted! In between alternately slicing open and gluing my fingers together while working on the wraithguard, I got some brush time in and finished up the first squad of Glade Guardians and a Bonesinger (Woodsinger?) to accompany the various wraith constructs the force will include. Keeping the same scheme as the Wraithlord from earlier meant that the armor would be varying tones of brown and bone, which meant for quite a while during the process the models looked TERRIBLE. Gotta love that interim stage in the painting process where you can't help but think to yourself "Well, these look like garbage!". Persevered and got the oranges, reds and yellows in place and they started to look a bit more autumnal - I think they'll fit in nicely now! Due to the fact that the force is going to include a ton of wraith constructs, I dug out an old Bonesinger that had been rattling around in the Closet of Doom for ages. From an aesthetics point of view he's not particularly converted other than the addition of some bugs (a common theme across the force). It was fun to finally paint a model that's been languishing for well over a decade! Apparently they did a brief re-release of the model late last year, and included a set of rules for him for 8th. Perfect timing! As alluded to above, I spent a little more time hacking apart the plastic kits and finished up the first full unit of Wraithguard (Branchwraiths?). Really pleased with how they've come along, and can't wait to get some paint on 'em. Now if only it wasn't currently snowing outside I could get them primed! 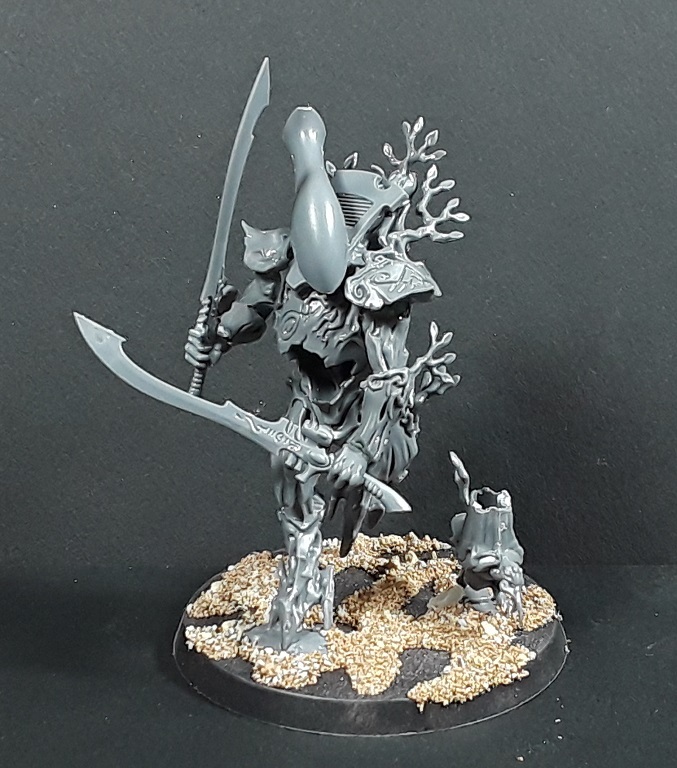 As the Kurnoth Hunters come three to a box, there was one leftover body, so I took the opportunity to test build the first of the Wraithblade models - I think I'm going to do a 5-strong unit with twin swords and a 5-strong unit with axes and shields. The running poses of the Hunter models lend themselves well to the melee style wraithblades, not to mention it opens up the pose a bit allowing for the cool hollow torso detail to be seen (well less so in this picture, but still). At this point I ran out of bits and have to wait a week or more for the next order to arrive, but all in all the army is shaping up nicely! Thanks much! Gotta love the banzai primer session in the brief stretches of reasonable weather. Go! Go! Go! ...Stop! Now they look great. Love the orange colour for them. Be interesting to see how you incorporate it into the wraith constructs. Cheers! Aye, there's definitely room for pushing the eldar bits a little further - Going to try some on the upcoming wraithblades! I was going to suggest something on their heads, just because they're so smooth, your original test model had some extras, so perhaps they're being added later? 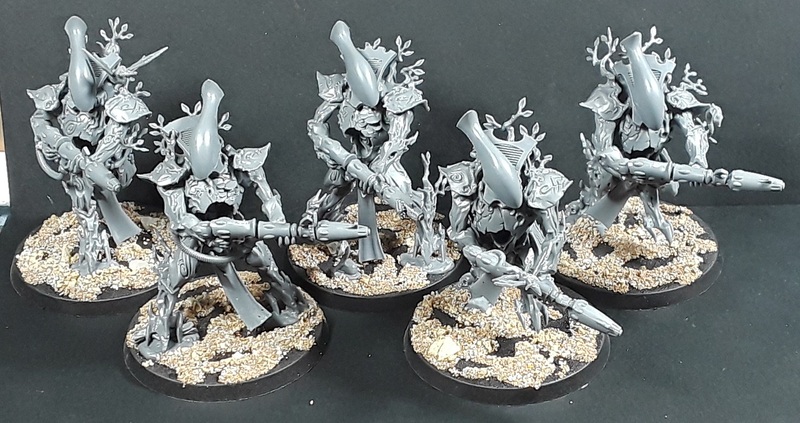 Aye - I've been scheming on something akin to the antlers on the Wraithlord, there are some interesting branchy bits on the hunters kit that may work well! Cheers! As for priming... get a large card board box and you are set to prime indoors. Might smell a bit afterwards but it soon dissipates. But most importantly.. no spray were the missus don't want it. This is a fantastic looking force. I hope you keep this one! I may have to, with as ridiculously overpriced each unit is (being comprised of several kits) it'll be a tough sell to recoup the costs. Heh. This is such an awesome mashup idea! It’s going to be be beautiful on the table. That running Wraithblade idea is just stunning.